The human brain is a very fascinating thing to me. Because I am so infatuated with the human brain I decided to major in the psychology field. My main focus on the psychology field is adolescent psychology, which is why this blog explains to you how children’s brains behave and how we can make our children of the future more critical when thinking and learning. Psychological development is a very important science study. I say this because psychological development explains how we develop throughout time from babies to adults. That article I just pointed you to argues that you should teach your infant different languages when they are first born because at that age they are learning moral understanding, language, problem solving, motor skills, and developing a sense of identity. As an infant, brain development isn’t fully formed yet, because it’s still developing. It helps to teach your child at a young age different languages and inviting them to use different learning styles. It has been said that if parents do this while their child is young, the child will develop more advanced skills and knowledge. Mainly because when we learn we learn from simple to complex styles. When learning in this way, we use trial and error, and babies do this as well. So when they are being challenged at young ages they grow up to be resilient when challenged. 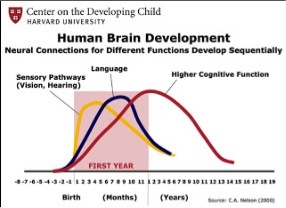 So my advice is start teaching your kids when brain development is still being developed, so your child can be able to learn at these complex stages at an early age. Hopefully in a few years, maybe I will be your next child’s psychologist.